If you will increase the control over mind, success will be near to you. To increase the control over mind is not difficult, if you have learned to basic control over mind. You can easily increase this level at higher level, if you will follow my simple steps. 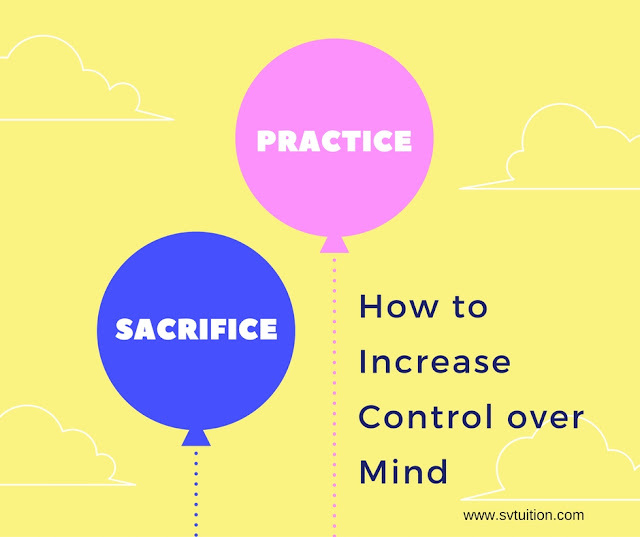 You have to practice all these steps and also sacrifice what is necessary for more control over mind. If you want to increase your own control over mind, you need to start by imagination of result of your every decision. Word imagination drives from image. When you will create the image of any of your decision, your control on mind will more. You want to decrease your weight. For this, you want to leave non-veg.. But you are unable to leave it because have addicted non-veg.. Still there is hope for you. You have to start creating image every time, you attract to eat non-veg. This image will be a fat person who has the heart disease and who is unable to run fast. On the other-side, you want to become smart and active. For this, you need to eat veg. food and do more exercise. Every-time, you do more push up, you have to create a great image of smart person inside you as its good effect. This imagination will surely increase your control over mind about what you will do or what you will not do. Positive thinking is power. In your mind, there are two type thoughts come. One is positive and second is negative. Negative thoughts decrease the control over mind and positive thoughts increase control over mind. So, if you think more positive about everything, you will surely increase your level of control of your mind. Fix the goal helps to achieve the goal. So, your mind will not wonder any other way. Your mind will not wonder to go to know what happens about your aunty or uncle. It does not go to know the trailer of latest film. It will have the goal which it has to achieve. So, your level of control of mind will increase. Human being is the slave of habits. If you have good habits, there is no doubt, your level of control over mind will increase. If you have bad habits, there is no doubt, your control over mind will decrease. So, try to avoid bad habits. At the time of school, you have received both rewards and punishment.Now, you are doing your own help. If you have done good, you have to give the reward to yourself. This reward may be picnic to your favorite place or party with friends. If you did anything wrong due to lack of control over mind, you have to give punishment to yourself. This punishment may be the fast from 1 day to 7 days. Stress creates default in the working of mind. If you have to increase the strength of your mind's control, you must reduce your stress. Count 1 to 100 with deep breathing. It will carry you zero level of stress. No Comment to " How to Increase Control over Mind "